Back in the heady days of the late ’90s, a number of my friends and fellow students were irritatingly good at Dance Dance Revolution. They devoted countless hours to it, and carried on earnest and lengthy discussions about technique. So I can feel only gratitude that this appealing crossover wasn’t around to further detain their attention. Uberdam Cavaletti teaches computing at a professional training school in Xanxerê, Brazil, where each year they hold an event to show off projects the students have been working on. Last year one of these projects involved a Raspberry Pi, a DDR-style platform and a much older electronic game. The starting point for Uberdam, his colleagues and students was Simon, a compelling game from the late 1970s in which players had to press coloured buttons to replicate increasingly complex sequences displayed by the device. They were running an existing Python clone of this game, Simulate by Al Sweigart, on a Raspberry Pi; Uberdam’s class had the idea of allowing a player to use their feet to play, instead of a keyboard and mouse. 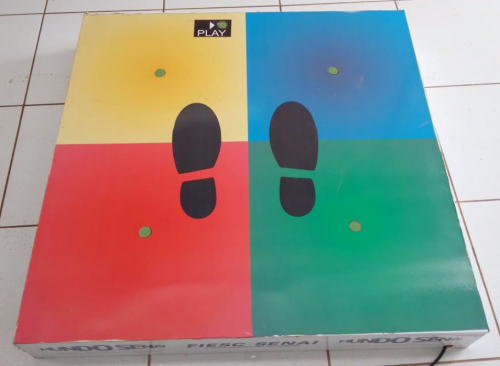 In their DDR-alike version, a Raspberry Pi displays the sequence for the player to replicate via a projector, and capacitive sensors underneath the coloured platform detect steps, allowing the Pi to check the player’s performance. There’s more about the game in Uberdam’s blog post (in Portuguese); I first spotted it in Hackaday’s piece. Meanwhile, if you like the idea of making your own electronic games, you don’t need heaps of experience. In the Make section of our free resources you can find out how to make a Sweet Shop Reaction Game using Scratch and a Quick Reaction Game using Python, both great places to start! A good way to relieve stress from Windows 10. However there are other PCs in my house, and trying to get them to upgrade seems to be rather like pulling teeth. I’m guessing their servers are getting royally hammered.